Hours: 1,800 h - Reg. number: 4537 - General very good condition used equipment, ready for use. - Single drum roller in 2010. Hours: 4,000 h - Reg. number: 499569 - Without cab Cat V8 engine - Single drum roller in 1985. General good condition used equipment, ready for use. - Walk behind roller in 1999. Ask for price - General very good condition used equipment, ready for use. - Walk behind roller in 2000. Hours: 2,663 h - Reg. number: 60113915 - Canopy Road docs - Tandem roller in 1998. Ask for price - Hours: 6,700 h - General good condition used equipment, ready for use. - Combi roller in 2002. Ask for price - Hours: 113 h - General good condition used equipment, ready for use. - Combi roller in 1999. Ask for price - Hours: 2,600 h - General very good condition used equipment, ready for use. - Tandem roller in 2008. Roller tandem - weight 8,1 ton - Tandem roller in 2009. Ask for price - Hours: 863 h - General very good condition used equipment, ready for use. - Pneumatic roller in 2012. Ask for price - Hours: 3,400 h - Standard width: 250 cm - Max. 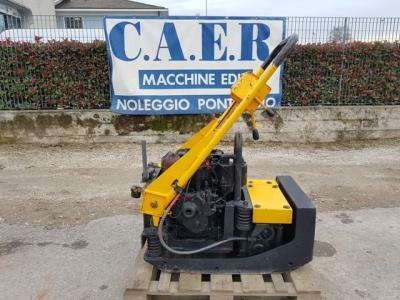 hydraulic extension: 500 cm - General very good condition used equipment, ready for use. - Wheel asphalt paver in 2003. Ask for price - Hours: 108 h - Excellent condition used equipment, ready for use. - Track asphalt paver in 2015. Used equipment ready for use. - Wheel asphalt paver in 1994. Ask for price - Excellent condition used equipment, ready for use. - Vibratory plate compactor in 1993. Weight: 465 kg - Used equipment ready for use. - Vibratory plate compactor in 2005. Ask for price - Hours: 726 h - Reg. number: 18500422 - including radio control - Tandem roller in 2007.